Now day’s hair loss is becoming a major social problem in our society. Unfortunately, the younger population is suffering most. The most common cause of hair loss in a male is hormone and genetic and in female mainly genetic as well as hormone. The important cause in today’s modern era is pollution, food adulteration (high amount of pesticides in food) and stress. Our diet concept is also defective. We consume more calorie diet than nutritive diet. 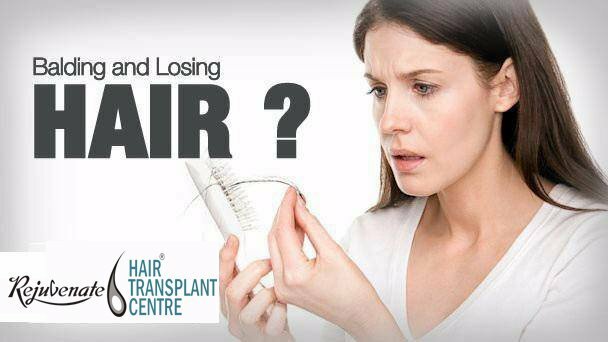 At Rejuvenate hair transplant centre two studies were conducted. One study was related to hair loss in relation to profession. It was found that maximum (26%) hair loss was in doctors, engineers and professionals. The hair loss was very less in labour class (5%) and not a single bagger was found bald. This study proves that hair loss is directly linked to stress. Another study was for vitamin level in patients with hair loss. The vitamin deficiency was found in more than 90% of patients which was of the severe grade. In more than 95% young female ferritin was deficient. So we can say we almost all are suffering from some or other vitamin deficiency. Another defect in our diet is a protein deficiency. At rejuvenate hair transplant centre we have designed a “REJUVENATE HAIR REGIME / RHR”. We treat hair loss for men and hair loss for women on four levels. The first level is to treat stress, the second level is diet modification, the third level is vitamin, minoxidil and for male finasteride. The fourth level is PRP and low light laser therapy. Results of RHR comes in 4 to 6 months.